As a preview, here's a scene from Wilbur H. Durborough war film On the Firing Line with the Germans (1915). Durborough and his camera operator Ries accompanied the German army in the summer of 1915 during the attack on Russian Poland. Their work at times was dangerous, as they noticed while entering the city of Bloni about 16 miles west of Warsaw. The intertitle of the film reads: "Surprised by Russian snipers at Bloni, in which one man was wounded and we were very nervous for a few minutes while the 'fun' lasted." For those of you who were not at Pordenone, Italy, here's a link to Charles Musser's weblog on his pilgrimage to the 33rd edition of the Film Festival, highlighting his comments on some remarkable silent movies that were shown this year such as the Nibelungen by Fritz Lang and Fred Niblo's Ben Hur. 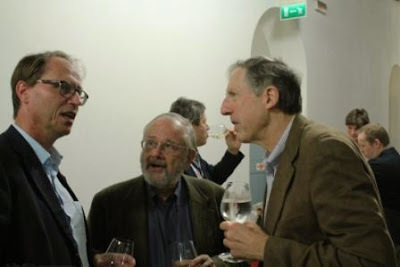 Charles also mentioned in his blog the new books published by John Libbey that were presented at Pordenone, including our publication on the American cinematographers of World War I, and as you can see we enjoyed the book launch very much. Great prosecco, John! 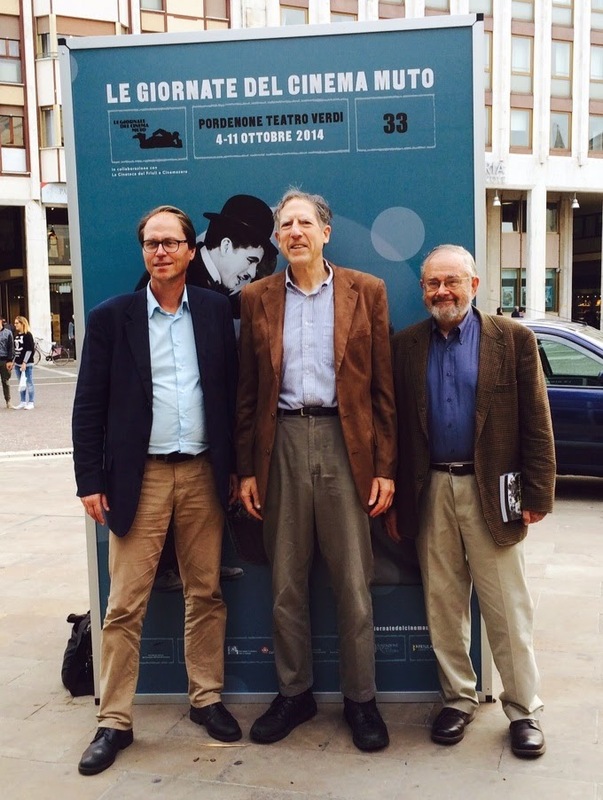 On Thursday October 9, all three authors were at Pordenone for the presentation of our book American Cinematographers in the Great War. Apart from watching some outstanding silent films, we all enjoyed meeting fellow scholars and historians who like us are grateful for the Pordenone film organization to set up this remarkable annual platform where we can exchange the latest news and insights on old films that have been lost and found. Thank you all for this wonderful experience! It has been a great ride! Book launch at Pordenone, 9 October! 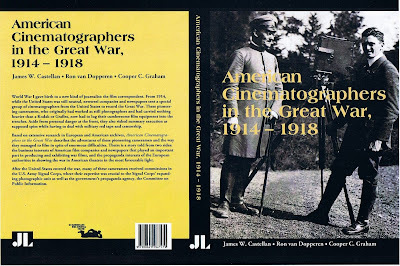 The official presentation of our latest book American Cinematographers in the Great War is set! On Thursday evening October 9, 2014, at the Verdi Theatre in Pordenone, Italy, this publication will be presented for the first time. 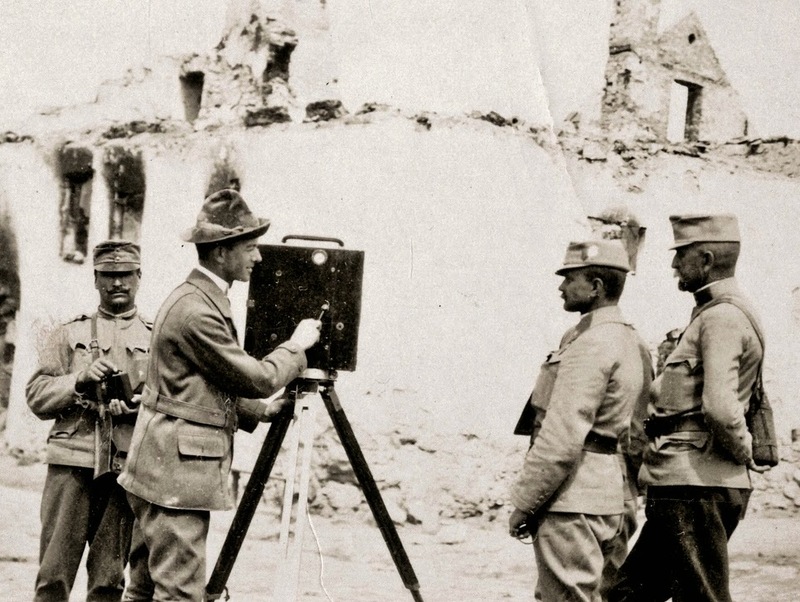 On behalf of our publisher John Libbey and the Pordenone Film Festival as a sponsor for this book we invite you all to join us and get to know the story on these remarkable American cameramen of World War I. All authors will be there to join you during the book launch! The three-part DVD series shows how the Habsburg Monarchy used motion pictures as an increasingly important tool for publicity and wartime propaganda. Part I of the DVD series has an unusual scene, taken from a still photograph found at the Austrian State Archives. The caption says - translated into English - "A cinematographer in the destroyed city of Ivangorod, 1915." As it turns out, the cinematographer is not an Austrian or even a German but the American film correspondent, Albert K. Dawson, from Vincennes, Indiana. Albert Dawson in camp before Przemyśl, May 1915. Photograph from the collection of the National Archives, Washington, D.C.
An extended version of scenes, found before by the authors in the Imperial War Museum, showing segments of Albert K. Dawson's film The Battle and Fall of Przemyśl (1915), has been uploaded on the website of the European Film Gateway/Project 1914. These films are from the Austrian Film Archives and have Hungarian subtitles. The aftermath of the conquest of Przemysl by the German-Austrian armies is shown, as well as scenes showing Dawson inspecting the ruined forts and the Russian soldiers who were killed in action while defending Przemysl against Austrian machine gunners. Check out a video from the Imperial War Museum, showing some of these scenes. Our latest book American Cinematographers in the Great War will be distributed in the U.S.A. through several channels, including Amazon.com. The book will be available from January 2015. American Cinematographers in the Great War will be available for customers in the U.S. and Asia through Indiana University Press. 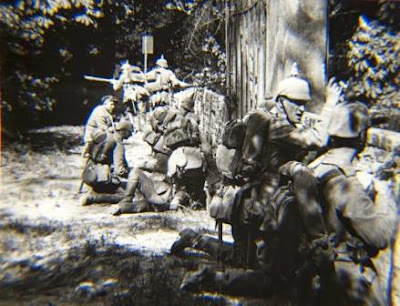 Sneak Preview "American Cinematographers in the Great War"
Thanks to publisher John Libbey and the Pordenone Silent Film Festival, we have recently completed a new project. 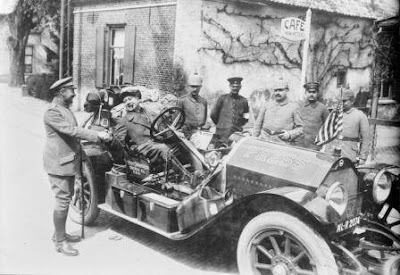 Our next book will be called American Cinematographers in the Great War and will be a complete overview of the adventures of American cameramen in World War I, set against the rise of the American film industry and the use of film for propaganda purposes by the European authorities. As co-author for this new book, we welcome aboard James W. Castellan, an independent scholar researching a biography of journalist Oswald F. Schuette and articles about some historically significant individuals with whom Schuette associated, including photojournalist and World War I cinematographer Wilbur H. Durborough. Castellan, a graduate of Brown University with an M.S. from the University of Pennsyslvania, retired from the pharmaceutical industry in 2001. 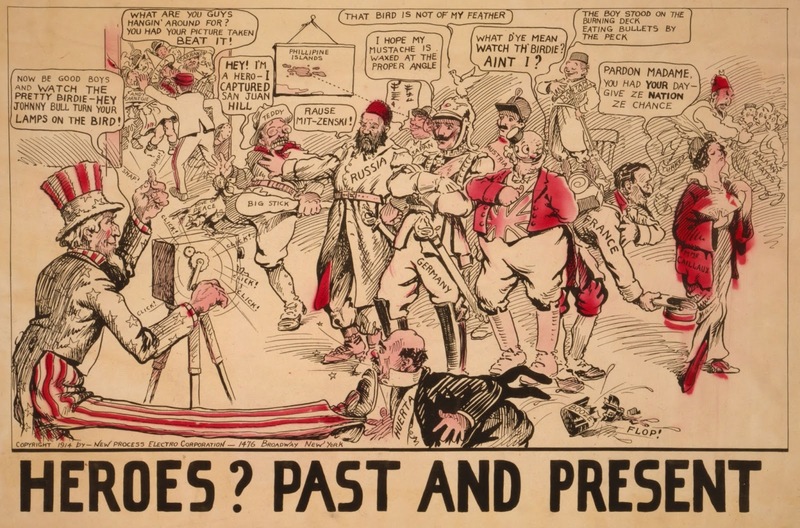 Ron van Dopperen and Cooper Graham uncovered one of the least known, yet vastly important efforts in the Great War: Propaganda through film. 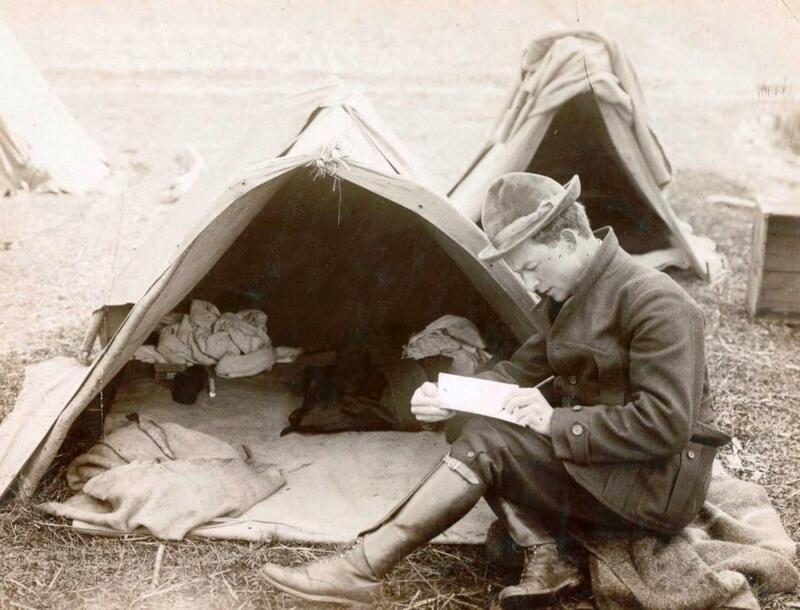 The American Correspondent Film Company was the brainchild of Heinrich Albert, the German Commercial Attache and Spymaster in the United States during the war. With funds from the Imperial War Department he helped organize a wholly new propaganda war in the United States. 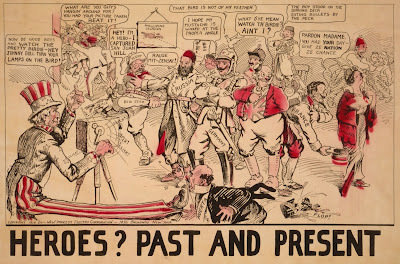 Despite its failure to convince an American public not to go to war against Germany in World War I, the use of propaganda as a tactical weapon became one of the mainstays of Nazi Germany some twenty years later.